Tung Tien are the most famous Caster & Wheel supplier in Taiwan. 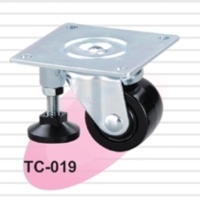 Furniture casters, medical casters, industrial casters and institutional casters form a specialized manufacture. For more information in choosing the right casters for your application, or to request a copy of our catalogs, please e-mail to tungtien@ms38.hinet.net.